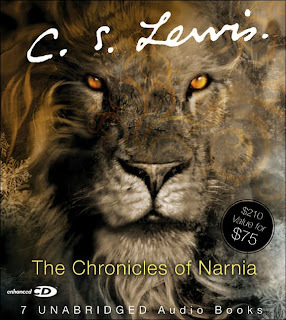 I never read The Chronicles of Narnia as a kid. I'd heard of them, but honestly, my big sister liked them, and she also liked Little House on the Prarie, and so I wrote them off, being a cool boy and all. This meant that I was starting into them with no idea what to expect when I started reading them to my son a few years ago. I was blindsided by the religious allegory, and in a very nice way. I was very impressed with the book. The language and reading difficulty is targeted to late elementary school or early middle school reading level, but the story appeals to all ages. The books move quickly and can be read in 3-4 hours each if you read as fast as I do anyway. They're light and pleasant, engaging and fun. The audiobooks are read by professional actors and very nicely done, including consistent voices and appropriate intonation. I'd give the story 8 out of 10 only because it's not as complex and interwoven as books I rate higher, and the audiobooks 9 out of 10 for quality. 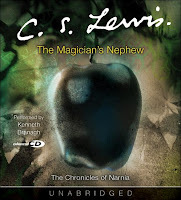 The Magician's Nephew is the first in the set chronologically and probably my least favorite in the series. It really is the back-story to the other books, most of which were written earlier. It deals mostly with characters not in the other books, which is probably why it doesn't seem as interesting to me, though it is still worth the read. One fun thing about this one - it's read by the same guy who plays Professor Lockhart in Harry Potter and the Chamber of Secrets. 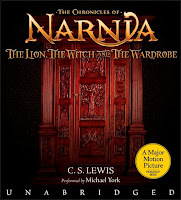 The Lion, the Witch, and the Wardrobe is the most widely known in the series, and for good reason. Great story, and they did a good job with the movie. The atonement allegory is all but impossible to miss, and there's plenty of peril, adventure, and fun. My son cried and cried when I read the chapter, the Triumph of the Witch, which blindsided me since I didn't know it was coming, but I did understand the allegory and it made a powerful teaching moment. 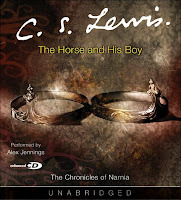 The Horse and His Boy is my favorite of the books. 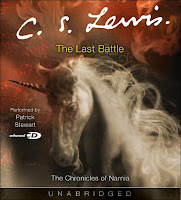 It occurs after the main events of the Lion, the Witch, and the Wardrobe, but before the end of the book, and involves in a minor way the major characters from the story, focusing instead on a storyline and characters independent of the other books. It has a very powerful scene, in which the hand of Aslan (who represents Jesus) in the life of the main character that gives me the chills. It also has two of my favorite quotes: "He had not yet learned that if you do one good deed your reward usually is to be set to do another harder and better one," and "Years later, when they were grown up, they were so used to quarrelling and making it up again that they got married so as to go on doing it more conveniently." 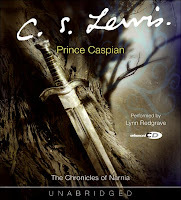 Prince Caspian is another popular one, the second made into a movie (although they took some big liberties in how they cut and pasted the plot together for the screen play), it has the same kids as the Lion the Witch and the Wardrobe, and makes a great story. 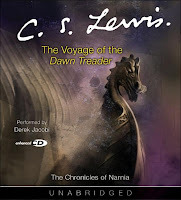 The Voyage of the Dawn Treader is another personal favorite - close runner to the Horse and His Boy. Lucy and Edmund are back from the last two books, as is Caspian and Reepicheep, one of my favorite characters. This book will make an odd movie since it's more like a series of adventures along the voyage rather than a single building plot. Makes a great book though. My favorite thing about this is Eustace's experience with Aslan, and its allegory in the christian world of losing yourself to find yourself, and of putting to death the natural man and being born again. And the dark island where dreams come true - that part of the story to me is bone chillingly frightening, which of course makes it another favorite part of the books. 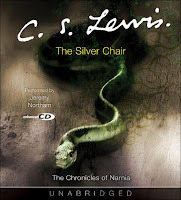 The Silver Chair kind of gets lost in the middle in my mind, but I find when I read it (or listen to it) I love the story. I love how it shows that the daily hum drum can distract us from remembering what's really important, sometimes with disastrous consequences. Puddleglum is another of my favorite characters too. The Last Battle is an interesting story. In this book, the religious allegory is impossible to miss. I wonder how they'll make it a movie without it being highly religious. Read by Patrick Stewart, otherwise known to me as Captain Picard of the Starship Enterprise.